I am pleased to announce, after a very spirited voting season, that we now have the winning T-Shirt ideas for both The Inklings and Guys Read. So with 34.24%, just edging out the second place idea, this is our 2015 Inklings T-Shirt. 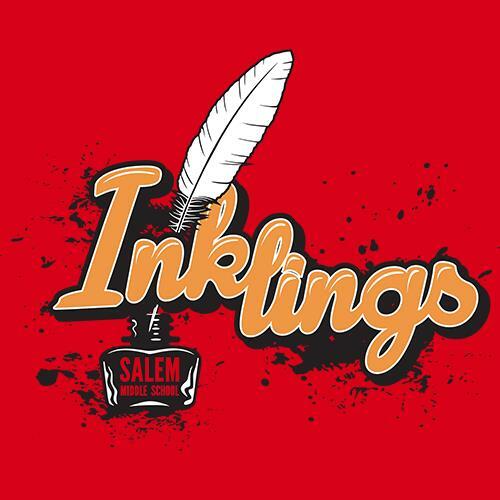 Remember the shirt will say Inklings where it now says Journalism and in the ink pot it will say Salem Middle School. The final cost will depend on how many orders we make, but it will most likely be somewhere around $13 per shirt. This shirt will say Salem Middle School above the line and then Guys Read below the line to the right. Voting is now closed, so I hope you are happy with democracy and will enjoy the final choices. Order forms will come out soon and the shirts will be ordered shortly, hopefully so we can have them when Track 4 returns at the end of October. The voting for club T-Shirts will end soon. I am cutting the Guys Read voting this Friday (Sept. 11) and the Inklings next Tuesday (Sept. 15). So if you want your voice heard get out there and vote! This post is mainly for parental units. As I have explained in many Guys Read and Inklings meetings, I like to let parents know that we do tend to make videos and post pictures of our reading challenges on the web. Most parents have already done a school release for photos and videos, but I want to be sure it is fine for me to upload images. I am attaching the permission forms for both Inklings and Guys Read, just in case a member has lost their note. For now three years we have democratically chosen our yearly Guys Read shirt. Last year we took our voting to the wild world of the the web and get ready because we are doing that again this year. First you should take another look at the eight current design choices and decide which shirt you would like the most. We will keep the voting live for a few days to give everyone amble time to have their voices heard. The winning design will be the 2015-16 Guys Read T-Shirt and be available for both the 6th Grade and the 7th/8th Grade Chapters. 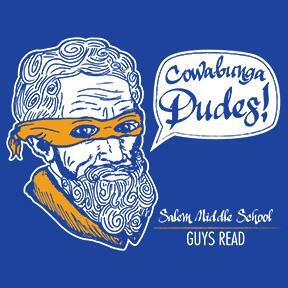 Today was the first meeting of the 7th/8th Grade Chapter of Guys Read. We began by enjoying some of our favorite Star Wars memories as we prepare for the onslaught of new Star Wars toys that will be hitting stores, like Target, around September 4. Most of the lads enjoyed the end of Episode III the best, I on the other hand, was pee my pants exited when I was driven from my grandparents cabin on Flathead Lake to Kalispell, Montana in the summer of 1984 to see The Return of the Jedi. Man I was in heaven! My new school computer then decided to freeze up, so whilst it rebooted we took advantage of the time and talked about stories we might like to start with this year. I had a few Scholastic Book Orders around the room that allowed us a nice browsing minute. We landed on two interesting, and cheap, ideas from the book orders. After a democratic and very close vote the lads have decided to start with The Iron Trial by Holly Black and Cassandra Clare. You should be able to find a copy relatively easy at the libraries and local stores, but if you would like to order a copy from Scholastic Books you just need to hand me $5 by our next Guys Read meeting. If you would like to write a check please make it out to Scholastic Books. We also were interested in a new story called I Am Princess X by Cherie Priest. I really liked the idea of pushing some gender norms and starting with a story that is clearly marketed for a girl audience, and a few of the guys were game, but in the end the vote came down for the Iron Trial first and I Am Princess X next. Princess X is also only $5 in the book order, and comes with four stickers! If anyone would like a copy you can add the $5 to your order and I will get you both books. I am looking forward to reading both of these stories and jumping into some interesting reading challenges with the ideas we find hiding within their covers. As always here at SMS Guys Read you do not need to buy the books and members are always welcome even if they have not read or finished the current read. It just makes it more fun when everyone is on the same page, so to speak. We ended our meeting by looking a few Guys Read T-shirt ideas. I will add the idea powerpoint here, and the voting post will go up very soon. Remember to vote early and vote often. It was great to see a few regulars and some new faces this afternoon. Please come back for our next meeting on September 8 from 3:15 to 4:10 in Mr. H’s room. It is finally time to get SMS Guys Read fully engaged! The 6th Grade Chapter of Guys Read has met twice during their 6th grade lunch. We will continue this Friday, August 28 and most Fridays while Track 4 is in session. At last Friday’s meeting we voted to read The Strange Case of Origami Yoda by Tom Angleberger while we waited for Secret Coders by Gene Luen Yang to come out later in September. The Strange Case of Origami Yoda is super easy to find, so 6th graders find a copy and start reading… Activities will start this Friday! The 7th/8th Grade Chapter will officially begin this Tuesday, August 25, in Mr. H’s room (2407) from 3:10 to 4:10. We do not have a first read, but we are thinking about starting with I Am Princess X by Cherie Priest. It’s only $5 in the Scholastic Book order and wouldn’t it be grand to have our first read be called Princess X? So I will see 7th/8th graders on Tuesday after school and the 6th graders on Friday at lunch. Last Thursday we had our first SMS Guys Read meeting, come on over to the Guys Read blog and check out what sort of crazy antics ensued. And the March Madness Winner is…. Battle of the Books – March Madness – The Finals!! !